LOCATION: River Club complex. Complex situated on the Piesang River, within easy walking distance of central beach (2-3 minutes walk) and across the road from a mini shopping complex. VIEW: Complex gardens and pond. Standard double storey house. Downstairs houses the open plan lounge, dining-room and kitchen with nook area opening onto patio overlooking communal pond and well communal maintained gardens. All bedrooms/bathrooms are upstairs. BEDROOM 1: Queen and en suite (bath/hand shower/shower/toilet) with TV, DVD and DSTV access, opening onto balcony overlooking pond and well maintained gardens. BEDROON 2: 2 Singles, opening onto balcony overlooking pond and well maintained gardens. BEDROOM 3: Queen, overlooking pond and well maintained gardens. - Linen, bath & beach towels supplied. - Single narrow lock-up garage. Tumble drier is stored in garage as well as patio furniture, built-in cupboards, chest freezer etc. - limited space. - Weber braai and patio furniture. - Single sleeper couch, no additional linen supplied. - Communal pond is alive with nature, specifically frogs which are quite vocal. - Swimming pool. Fenced-in but has no net or covering. - Squash & Tennis courts. Tenants to supply own racquets & balls & funds for squash court. - 24 Hour security check point at only access into/out of complex. 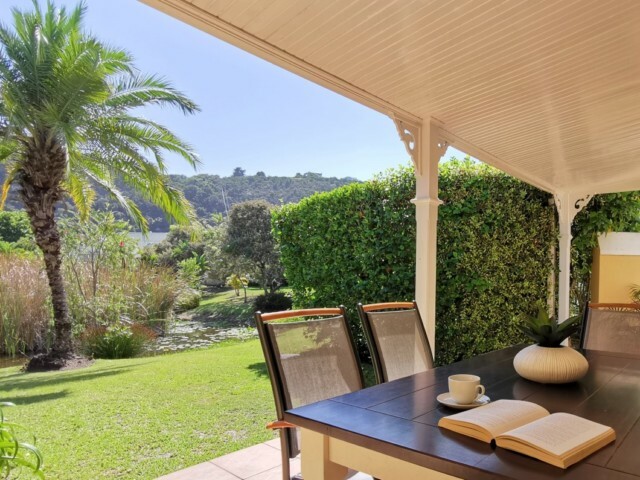 - Within easy walking distance of central beach, B.I. Hotel and mini shopping complex. - Well maintained communal gardens.